From left to right: Yurfa Glenny, PMP, vice president and Southeast Region Water Business Line leader; Alexandra Lopez, PE, intelligent transportation systems engineer, is the WTS South Florida Chapter membership chair; Robert W. Skaggs, PE, PTOE, Traffic/ITS manager; Luis Casado, PE, senior vice president, Water Business Line director, and Southeast Region director; Judy Hricak, CPSM, CiPP, vice president, chief communications officer, and founder of Connected Women at Gannett Fleming; Catalina Echeverri, PMP, project manager, is the WTS South Florida Chapter Transportation YOU chair and mentorship program co-chair; Jessica Carden, Southeast Region administrative manager; and Jeanette F. Berk, senior planning manager. 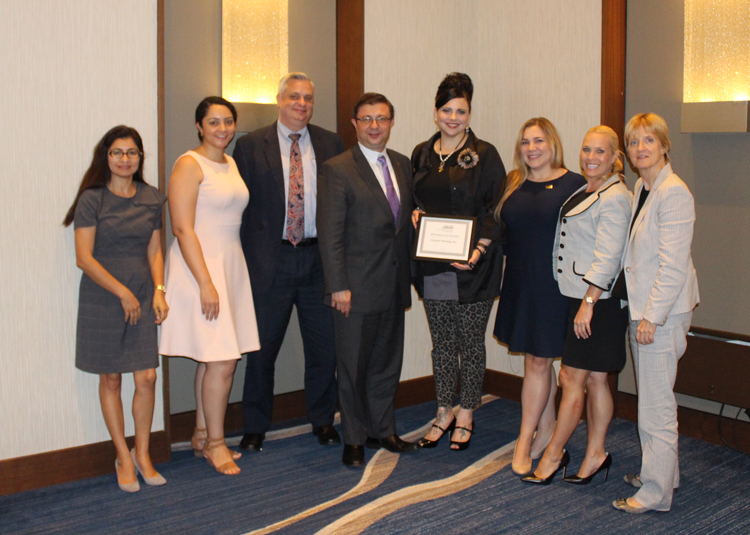 Miami — The WTS International South Florida Chapter honored Gannett Fleming as the 2017 Employer of the Year at its 2018 Annual Scholarship Awards Luncheon on May 30. The award recognizes Gannett Fleming’s commitment to creating equity and access for women in the transportation industry. The honor also acknowledges that the firm supports its female employees’ participation in professional organizations and provides the resources to continue their education and obtain credentials and advanced degrees.